How do I add new tunes? The easiest way to add tunes is to search for them by name. 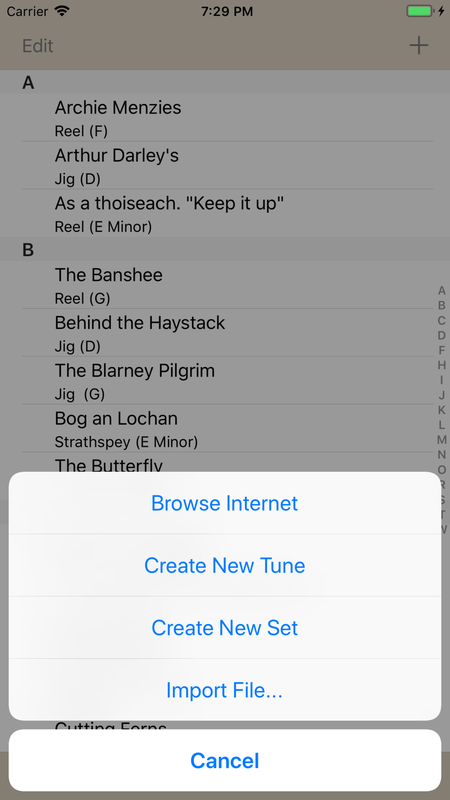 If you have a connection to the internet, the app will search for the tune and let you select one. Once you do that, you will see a preview of the tune and you can choose whether to add just that tune to your library or all the tunes in that file. When this is done, the tune you asked for is displayed. What does the "plus sign" mean on the tune list? The plus sign means 'add'. 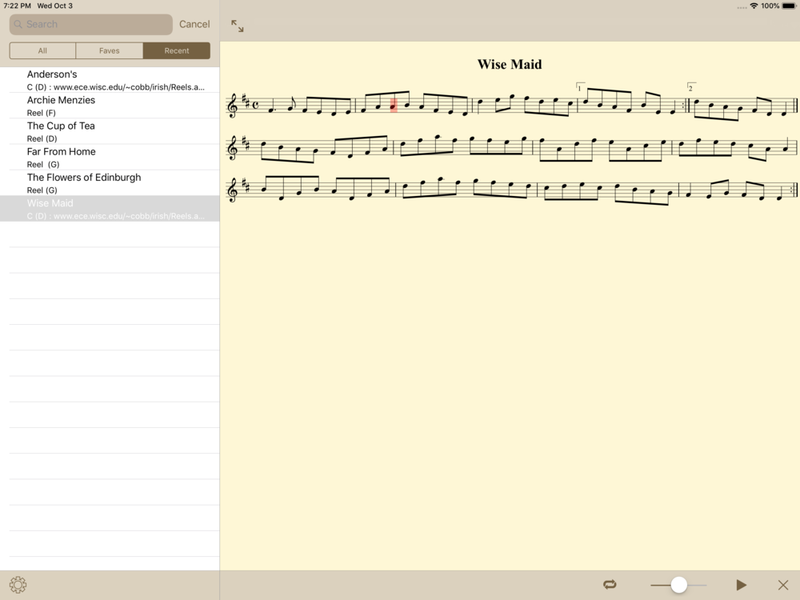 You can add tunes by browsing for them on the internet or by creating your own tunes in the editor. If you have tunes in an app that supports the Apple document interface, such as iCloud or Dropbox, you can import the file directly through the file browser (iOS 11 or greater). When you choose to browse the internet, you'll be able to use a mini web browser that starts you off at the abcnotation website. Navigate to an abc file using the links and search bar. Once you are seeing the abc file in the browser, tap on the download button, which looks like an arrow pointing down into a tray, to get the abc into your tune list. You'll be told how many tunes were imported. 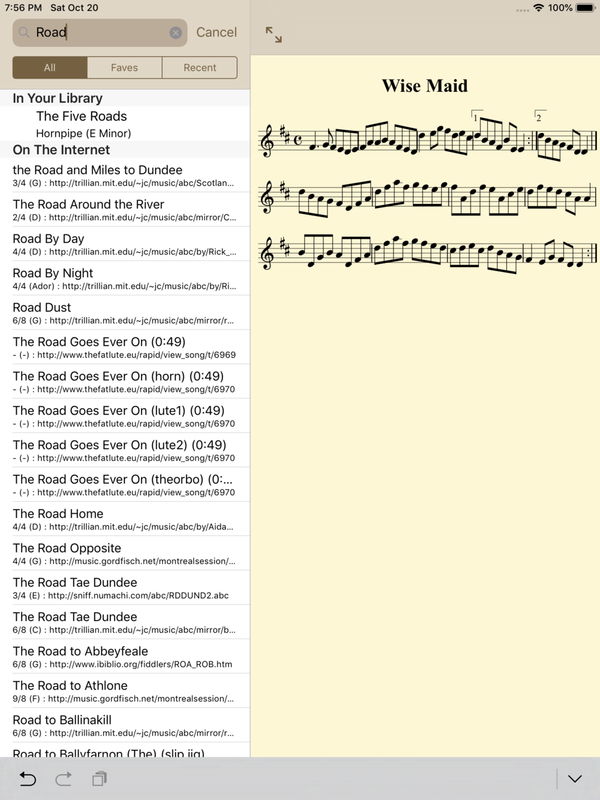 Now you can either import more or tap 'Done' to return to your tune list. How do I find a tune by name? Tap in the search bar and enter a few letters of the tune's name. As long as the tune title contains those letters, it will show up in the search results. Typing more letters will give you better results. If you tap the 'faves' or 'recent' buttons, search will be restricted to only the tunes you have on your iPhone or iPad. Favourites are those that you have tapped the star button on the toolbar, and recents are tunes that you have looked at recently, with the most recent at the top. Favourites will be marked with a star in the search results. Search will look at all the tunes you have on your iPhone or iPad, and if you have an internet connection will also try to find matching tunes on the internet. How do I enter my own tunes in abc? Tap the 'add' key on the tune list and choose 'Create new Tune'. You'll see the edit window with an abc template. Tap on the abc to edit it. Your changes will be shown in the top pane. Tap on the Save button to save your work, or the Back button to discard it. Because abc uses quite a few keys that are not available from the default keyboard, on the iPad the Craic will show a set of accessory keys that provide the most-used keys for tune entry. How do I play back a tune? Tap the little play icon on the toolbar at the bottom. The toolbar will show you a new set of tools. You can loop the tune, adjust the playback speed, or pause playback. You can enable the playback cursor to highlight the note that is being played. Tap the X to dismiss the playback tools. Can I change the Way playback sounds? 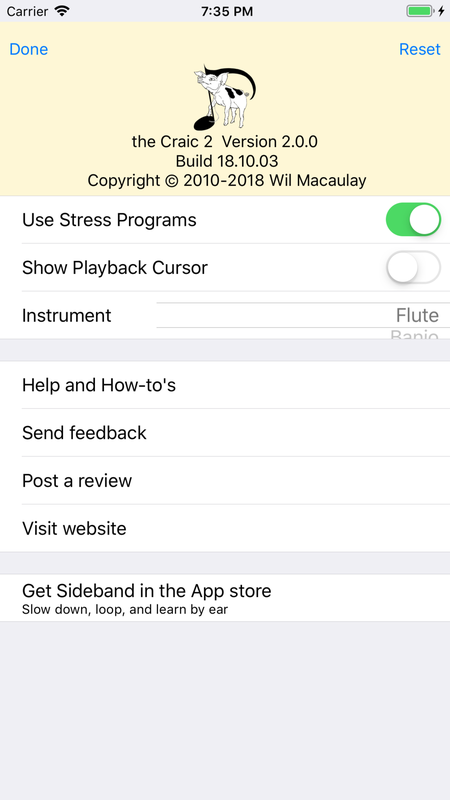 If you don’t like the default Flute sound, go to the Tools page by tapping the cogwheel icon. You can change the instrument here, as well as turning on the playback cursor. Stress programs are the way the Craic tries to make playback sound a little more natural, by stressing (for example) the first and third beat in a reel, or by ‘swinging’ a hornpipe. If you find this distracting, you can turn it off here. How do I send a tune to a friend? Tap the little action icon - it looks like an arrow escaping from a box - to get a dialog which will let you send by email. The tune is attached both as abc and as a PDF. I just got sent a tune by email. How do I get it into the Craic? In the mail app, tap and hold the abc attachment. You should be prompted to open the abc file in the Craic. I like paper. Can I print? So do I. Yes, as long as you have a printer that supports AirPrint, or a program such as Printopia running on your Mac. Tap the action icon and choose Print from the resulting dialog. Can I get a PDF to transfer into iBooks or some other app? Tap the action button and choose "Open as PDF in..." You'll be presented with a list of apps installed on your device that will take a PDF as input. The PDF will be named according to the tune. How do I transfer my abc tunes that I have on my PC or Mac? The fastest way is to use iTunes sharing. Connect your iPad or iPhone to the PC, and start up iTunes. When the iPad or iPhone is detected you should see the Craic show up in the list of apps that support iTunes sharing. You can drag as many files as you want into the iTunes window for the Craic. If you have Dropbox and the Dropbox app on your PC or Mac, you can drag your abc files into Dropbox, then select them in the Dropbox app. You'll be prompted to open them in the Craic. This is a little slower because you'll have to transfer one file at a time. You can also Import using the plus sign on the first page. What about advanced ABC, like lyrics and multiple voices? Partly! I’m still working on. These are still being addressed by the abc developer community. The hymn below is taken from the OpenHymnal project, and I had to do some tweaking to get it to display. If you are interested, in learning more, get in touch at info (at) thecraic (dot) co. I’m still working on it, but as you can see, it is coming! Does the Craic run on a Mac or PC? Not yet. It is written in Objective-C, which should make a Mac port possible in the not-too-distant future but which will make it difficult to put on the PC. EasyABC is available for both platforms -check it out! Probably not - it's too different.